LAMP REVIVAL’s recycled lamps and ceiling lights are built from salvaged and vintage lamps, electrical parts and pipe fittings. Custom lamps and lighting fixtures are offered, as well as repair and restoration of lamps and lighting fixtures. These recycled lamps and whimsical lighting fixtures redefine the concept of quirky lighting and unique lamps. These amazing lamps make perfect gifts, too! Recycled steampunk lighting not only delivers exciting industrial lighting, but also reclaims a huge amount of heavy weight scrap metal salvaged from landfills. Machine age lamps are probably the most scrap hungry class of recycled lamps. With origins from the era of steam power and the Machine Age, the genre has become wildly popular in contemporary decor. Pipes and pipe fittings are an incredibly versatile material, really ideal for creative lamp design. A variety of elbows, Ts and couplers facilitate almost any imaginable configuration of industrial-style lighting. LAMP REVIVAL has built inventive pipe table lamps, pipe ceiling lights, as well as pipe floor lamps and sconces. Whimsical table lamps, the first recycled lamps created by LAMP REVIVAL, are built primarily from salvaged lamp parts, electrical boxes, pipe fittings and various other discards. LAMP REVIVAL’s collection of personified character lamps includes Carmen Electra, Lady Marmalade, Roy and Dale, Fred Astaire and Ginger Rogers, Bullet the Dog, Dame Margot Ballet Lamp, and even a Statue of Liberty lamp. Whimsical lamps, quirky lamps and funky lamps are totally fun to make, and equally exciting to own. Discarded vintage sports equipment make interesting sports lamps. LAMP REVIVAL recycles potential landfill into sports lamps appealing to both athletes and fans. Ceilings lights are another wonderful place to display recycled discards. LAMP REVIVAL has assembled ceiling lights and pendants from electrical parts, lamp parts, bottles, and even a vintage typewriter. The possibilities are endless. Lamps made from found objects are also fun to make. The enjoyment usually begins at visits to flee markets, yard sales, antique shops and transfer stations where you just never know what you’ll find. Spur of the moment lamp design is needed to choose just the right components for building amazing lamps. Musical instrument lamps are a great way to recycle your long-forgotten childhood band instrument, your father’s beloved music maker or a vintage instrument found at a yard sale. LAMP REVIVAL’s previous examples include accordion lamps, trumpet lamps, clarinet lamp, French horn lamp, guitar lamp and a drum lamp. Based on 15 years of creating amazing lamps and lighting fixtures, LAMP REVIVAL has demonstrated capability to build custom lamps from your keepsakes and treasured objects. Contact LAMP REVIVAL to discuss your custom lamp requirements. LAMP REVIVAL produces custom photograph lamps and lamp shades using Photoshop image processing. 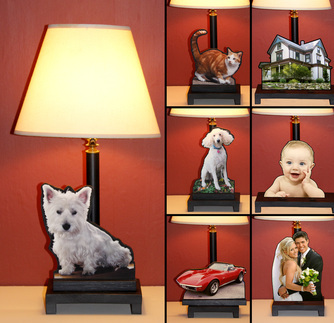 Photo lamps incorporate YOUR cut-out photos mounted on a simple black column lamp. A great way to commemorate a special occasion or send thoughtful gift. Custom photo lamps made from your pictures: dog lamps, cat lamps, baby lamps, car lamps, wedding lamps, house lamps or whatever you like. Contact Lamp Revival to learn more. The same expertise and painstaking care that goes into making these lamps are used to repair and restore broken lamps. This know how and large inventory of new and salvaged vintage lamp parts means that the lamps and chandeliers will be fixed right and safely. Certainly, better than the sometimes dangerous do-it-yourself repairs.